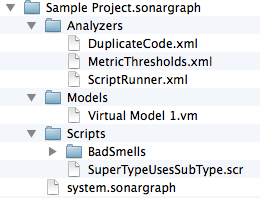 system.sonargraph contains all information necessary to parse the code, i.e. the workspace information about modules, directories, etc. See Section 7.7, “ Managing the Workspace ” and Chapter 5, Creating a System . Analyzers sub‑directory contains configuration for code duplication, metric thresholds and which of the Groovy scripts are executed automatically. Models sub‑directory contains the virtual model files, i.e. the information about resolutions (todo, ignore, fix) for detected issues. Scripts sub‑directory contains the Groovy scripts that allow custom queries.